Almost all toilets have a similar tank capacity. 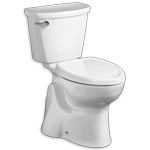 When choosing a tank, you’ll have flush valve size and flush lever positioning to consider, as well as the flushing system. The kitchen may be the heart of the home, but the sink handles most of the daily chores. That’s because it’s the only working area used to both prepare meals and clean up after them. 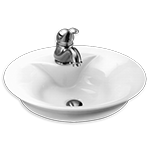 Although quality sinks can last 15 years or more, they do wear out. If you’re planning a kitchen remodel, it makes sense to replace your sink and faucet. With so many options — single bowls to multiple bowls of different sizes, shapes and depths — you need to consider the size of the room and how you’ll use the sink. 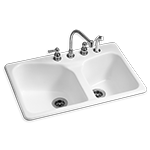 Large multibasin models, which are popular right now, will overpower a small kitchen. 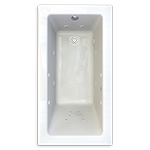 Wall mount sinks feature a basin that it hung from the wall at a location and height that you choose. Lately, these sinks have seen a rapid gain in popularity. In part because there are so many attractive and innovative designs available, but also because they’re ideal for universal access applications. If you’re remodeling and looking to add a new bathtub to your bathroom, find out what options are available for bathtub types, installation options, and materials to find the perfect tub for your bath and budget. Soaking: Extra-deep dimensions allow the bather’s body to be completely submerged. It can be either built-in or freestanding. Walk In: Climbing in and out of a slippery tub can be dangerous, but a walk-in tub is great for those with mobility concerns. Need a bathtub and a shower but don’t have the room for separate pieces in your bathroom? 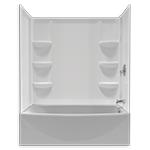 A space-saving combination tub-shower is a smart choice. These two-in-one units make the most of limited space by providing all the benefits of both a shower and a bathtub in a compact footprint, which can be particularly useful in a child’s or guest bathroom. When you don’t have room or funds for a separate tub and shower, a combo model is also a wise choice for boosting your home’s resale value because it serves homeowners who prefer either option.